Easter celebrate Jesus Christ’s resurrection following the crucifixation and can be any Sunday between March 22nd and April 25th since it is tied to the Spring Equinox. In addition to religious observances, Easter is celebrated with candy, new clothes, the Easter Bunny, and colored eggs. 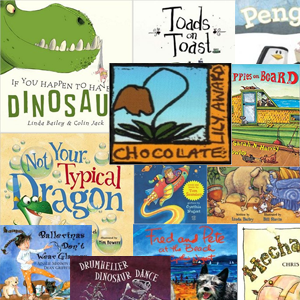 Tuck one of these Easter books inside any Easter baskets you come near! Links to additional information and activities about Easter follow these reviews. 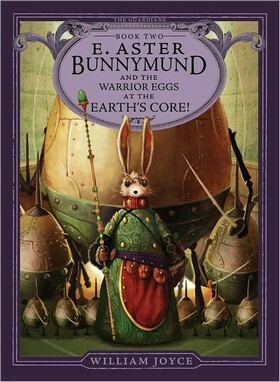 E. Aster Bunnymund and the Warrior Eggs at the Earth’s Core! Pitch, the Nightmare King, and his Fearlings seem to have disappeared or maybe just gone underground. Pitch hungers for the dreams of children and he wants to turn them into nightmares. Suddenly, the children of Santoff Claussen are kidnapped by Pitch who takes them to his subterranean hideout. Katherine, Ombric and the North Band must travel to the Earth’s core to rescue them. Helping them, of course, is the seven-foot-tall warrior interstellar talking rabbit, E. Aster Bunnymund, of the fabled brotherhood of the Pookas. With fantastic humor, puns, cultural allusions, clever twists, stupendously humorous chapter titles, and wonderful throwaway jokes and lines, the author never fails to delight. The delightful prose bunny hops across the pages and resides in our imagination. The word play tickles the eyes and also the tongue when read aloud. There is a Christian sub-text of the power of belief and the wonderfulness of light. We learn that Pitch who is total evil cannot abide light and that Pookas have been sworn to wield and protect this light. The giant Pooka advises us that he invented most of our trees, flowers, grass, and jokes but human beings still behave badly and “never seem to cherish the light” (171). One very tiny flaw– one wishes the clever and beautiful illustrations of the villains and heroes had been on corresponding pages for quick reference for those unfamiliar with the first book in the Guardians series. How can one not love a book that includes the line “…even a horse and a bear love a good story” (27). This is a novel about believing. We learn that “magic’s real power is in believing” (14) and “fear was an enemy that must always be conquered” (215), so click your heels three times and read this book immediately. Believe and conquer your fears and pray that the third book is soon forthcoming! Intended for readers ages seven through eleven, but adults as well will hoot loudly as they read. 2012, Atheneum, Ages 7 to 11, $14.99. Reviewer: Allan O’Grady Cuseo (Catholic Library World). The holiday, its symbols, and celebration are related and illustrated with photographs. Easter is a Christian holiday which celebrates the resurrection of Jesus Christ. The Bible tells of Jesus’ life, teachings, and his death on a cross. Three days later he rose from the dead. This became known as Easter Sunday. Easter eggs are a symbol of new life while Easter lilies signify purity. The Easter bunny is also a traditional symbol of new life. “People buy almost as much candy for Easter as they do for Halloween!” The 40 day period before Easter is called Lent. An inset says, “For many Christians, Lent begins on Ash Wednesday.” A photo shows a girl with an ash cross on her forehead. Eastern Orthodox Christians often celebrate Easter on a different Sunday. Clear colored photographs enhance the text. There is a table of contents, word list, Web sites, and an index. This is one of the “Buddy Book Holidays” series. This is a simple, clear explanation of the meaning and celebration of Easter. 2012, ABDO Publishing Company, Ages 8 to 11, 17.95. 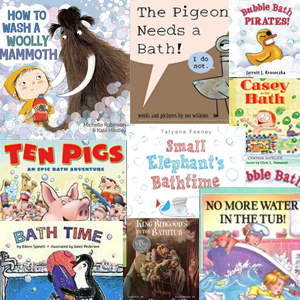 Reviewer: Carlee Hallman (Children’s Literature). Can you imagine? 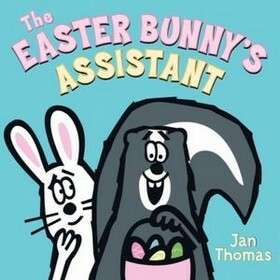 An Easter bunny chooses a skunk for his assistant? Young readers will turn the pages eagerly to see what disaster is ahead with such an off-the-wall helper. First off, the skunk lets off an obnoxious odor when he gets excited. Boiling eggs is exciting and mixing the dye is more exciting. Eventually the bunny realizes he must push the skunk, his stinky assistant, out the door. After all five steps in coloring Easter eggs are completed, the big question arises: should the bunny allow that skunk that knocks on the window to help hide the Easter eggs? With few words but gigantic colorful pictures, the novice reader can follow the steps for preparing beautiful eggs. The publishers offer a disclaimer to protect the writer from being liable for any accidents while making Easter eggs. Jan Thomas’ delightful drawings portray this Easter tale with clarity and humor. 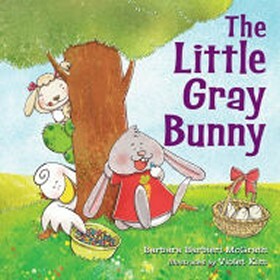 2012, Harper/HarperCollins, Ages 2 to 5, $12.99. Reviewer JoAn Watson Martin (Children’s Literature). Let’s celebrate Easter with Emma and her family! Basaluzzo’s bold illustrations vividly follow Emma as her family decorates and hunts for eggs, gets ready for and attends church, and joins relatives for Easter dinner. Emma decorates an egg by writing her name on it and after all of the Easter activities, she finally finds it when she gets ready for bed. It is exciting to see a picture book with an interracial family and relatives of both sides gathering together. This book is a great addition to the K-3 classroom. In this combination of fiction and nonfiction most of the spreads have an inset with an explanation of an Easter tradition or fact such as about three hundred years ago German settlers who brought the Easter Bunny to the United States. Also included are a table of contents, glossary, index, an Easter flowers craft, Easter related books and websites, as well as the publishers web site where a teaching guide for the “Cloverleaf Books Holidays and Special Days” series can be downloaded. 2012, Millbrook Press/Lerner, Ages 5 to 8, $6.95. Reviewer: Larnette Snow (Children’s Literature). The Little Red Hen folktale gets an Easter makeover in this story of a rabbit whose friends aren’t interested in helping collect, boil, decorate, and hide Easter eggs. McGrath (who offered a different holiday twist on this story in The Little Red Elf) deviates from the traditional repeated “Not I” responses, as the lamb, turtle, and duck snarkily refuse the rabbit’s attempts to engage them (“Do you even know me?” says the duck, lounging in its bathtub). Kim’s (Earth Day, Birthday!) T-shirt-wearing, turnip-headed hero exudes a sense of both earnestness and mischief, the latter surfacing in the wry “treats” he gives his not-so-helpful friends in the end–a trio of hyperactive, newly-hatched little red hens. 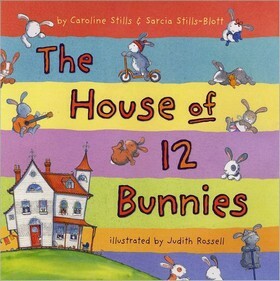 2013, Charlesbridge, Ages 3–6, $16.95. Reviewer: Publishers Weekly. This entry in the Enslow “Paper Craft Fun for Holidays” series focuses on the secular side of this religious holiday with eight crafts full of bunnies, eggs, and chicks. 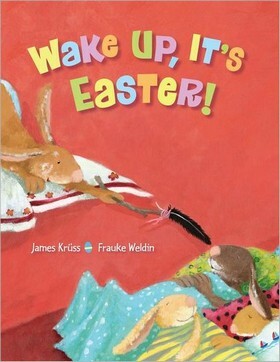 Even the two-page introduction gives no information about the sacred significance of this Christian holiday, instead concentrating on parades and egg hunts, and referring to the German myth of Eostre who sent her rabbit messenger with eggs as a symbol of the new life of spring. The only craft to give even a nod to the religious side of this holiday is a “stained glass” window made from black craft paper and colored tissue paper. Other crafts include tissue paper “Pysanky” eggs, a three-dimensional Easter lily card, and Easter egg stands made from decorated toilet paper tubes. Patterns (which need to be enlarged using a copy machine) can be found at the back of the book. Each project begins with a short paragraph of background information and includes a list of materials and numbered steps. Color photographs accompany each project and show the craft at various levels of completion. A large font on a pale blue background facilitates reading for young readers. All but the youngest crafters will be able to complete most of the projects with minimal adult supervision. 2012, Enslow, Ages 7 to 11, $23.93. Reviewer: Heather Christensen (Children’s Literature). All the other piglets wanted to be pigs when they grew up. Liam wanted to be the Easter Bunny.” That’s a peculiar and lofty ambition for anybody, let alone a young pig, and Liam’s perplexed immediate family tries to point him toward pragmatism (“‘You are a piglet,’ said Liam’s big sister. ‘Deal with it'”). It’s Liam’s grandparents who heroically defend his dream (“They just have the imagination of a kumquat, the lot of them,” sniffs his grandmother), rustle him up a bunny suit (“We will order one on the Internet”), and see him through to the fulfillment of his fantasy. Vail’s high-spirited and highly comedic text just begs for a whole-souled readaloud with rich vocal characterization that’ll make the most of both the humor and the touches of poignancy (“This is the kind of problem,” sighs Liam, “that is called heartbreaking”). 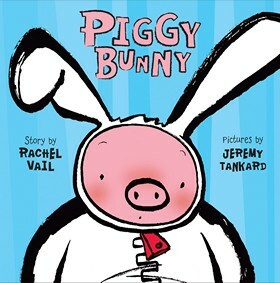 It’s a hilariously absurd story about a pig, but it’s also a cheerful championing of the kind of role play for which “pretend” seems a dismissive term and which sees little kids wearing their superhero capes to the supermarket; even beyond that, it’s a subtle reassurance about finding workable ways to explore a dream or an identity that may seem initially impossible. Tankard, author-illustrator of Grumpy Bird (BCCB 3/07), employs thickly solid yet fluid brushstrokes in figures that have a touch of Japanese graphic flavor in their streamlined cuteness; digital color makes the piglets a luscious pink that stands out against gently patterned tone-on-tone backgrounds in stripes and spots. This will be an enjoyably loopy and stealthily reassuring readaloud any time of the year, and it would make a terrifically offbeat Easter entry. Oink. 2012, Feiwel and Friends, Ages 5-7 yrs. Reviewer: Deborah Stevenson (The Bulletin of the Center for Children’s Books). A whimsical raven pens Easter messages for his wild neighbors in this rhyming paean to spring’s blue skies, warm sun and growing things. A timid vole then awakens a rabbit who bounds off to prepare his fellow hares for the holiday. Little ones will love examining the pictures for signs of the creatures’ home lives, including the raven’s tree-house hammock and tea set; the vole’s watering-can shower; the rabbit’s road marker to his burrow; and a flowering meadow visited by mole, worms, ladybugs and bees. The final double-page spread begs to be lingered over, with raven and vole enjoying a tree-branch tea party whilst watching the busy bunnies hiding Easter eggs below. 2012, NorthSouth, Ages 3 to 8, $16.95. Reviewer: Mary Quattlebaum (Children’s Literature).